Gary Allen, (author of the international best seller: “None Dare Call it Conspiracy”) reveals the shocking true story of the wealthiest, most powerful family in America. If there is one dynasty that wants to rule the world, it is the Rockefellers. 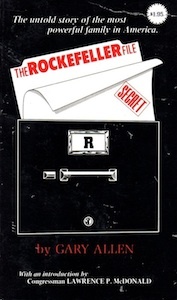 There is only one book about the most dangerously ambitious Rockefeller family you must read: “The Rockefeller File”. As America’s royal family of finance, the Rockefellers are this country’s super capitalists. Or are they? The original John D. hated competition and the free enterprise system. He was a ruthless monopolist who bought political influence to protect his economic empire. His descendants have carried his tactics worldwide.